Did you know the LDS church recently purchased an ad in the Playbill for the L.A. run of The Book of Mormon Musical? You can read all about it in this article. 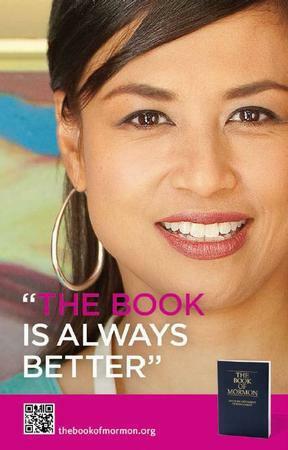 One of the ads features a woman smiling with the subtext, "The book is always better." I'm proud of the LDS church and their marketing/PR teams - this ad is hilarious to me. Need we take ourselves so seriously? Nope. 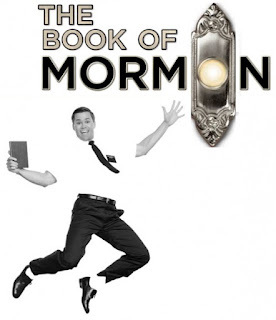 Previously, the only comment released on behalf of the church regarding the musical was in 2011: "The production may attempt to entertain audiences for an evening, but the Book of Mormon as a volume of scripture will change people's lives forever by bringing them closer to Christ." Awesome. Well played, LDS Church!